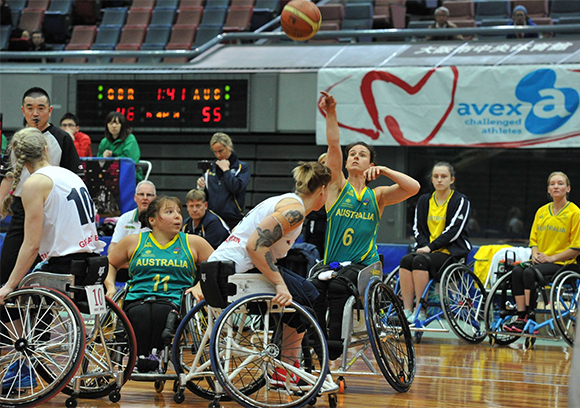 The 12-player teams for the Australian Rollers and Gliders have been revealed ahead of the Asia Oceania qualifiers in October, from which three mens teams will advance to the 2016 Rio Paralympic Games while just one spot is available for the women. The tournament will be held in Chiba, Japan from October 7-18. The Gliders boast five members of this year's silver medal winning U25’s World Championship Team in Amber Merritt, Georgia Munro-Cook, Georgia Inglis, Sarah Vinci and Ella Sabljak. Leading from the front, Shelley Chaplin has been announced as captain and Kylie Gauci as vice-captain, appointments that have thrilled coach Tom Kyle. With recent international success, the Rollers enter their tournament as back-to-back World Champions. Eight players from the 2014 IWBF gold medal winning team will be joined by Beijing gold medalists in Brett Stibners and Tige Simmons while Matt McShane and Sam White round out the side. “The past 3 years have been about development of individuals and the depth of the Rollers program. We are now heading into the end of the Paralympiad. Its business time," said head coach Ben Ettridge. Pre-tournament, the Rollers will have a short tour of Brazil to help develop the team culture before the draw for the AOZ qualifiers is released on September 15. The 2015 Gliders for the AOZ qualifiers: Cobi Crispin (VIS), Shelley Cronau (QAS), Shelley Chaplin (VIS), Leanne Del Toso (VIS), Kylie Gauci (NSWIS), Georgia Inglis (WAIS), Bridie Kean (QAS), Amber Merritt (WAIS), Georgia Munro-Cook (NSWIS), Clare Nott (WAIS), Ella Sabljak (QAS), Sarah Vinci (WAIS). The 2015 Rollers for the AOZ qualifiers: Jannik Blair (VIS), Adam Deans (WAIS), Justin Eveson (WAIS), Tristan Knowles (VIS), Bill Latham (QAS), Matt McShane (QAS), Brad Ness (WAIS), Shaun Norris (WAIS), Tom O'Neill-Thorne (NTIS), Tige Simmons (QAS), Brett Stibners (NSWIS), Sam White (SASI).